Update: I have found that while this technique is “cool” the taste leaves a lot to be desired. I did a follow-up test using flavor emulsion and that helped a lot. Even so, it’s not something that I would do except for the cool effect on a cookie platter. It seems like there are fads in the cookie making world just as in fashion. Currently, the latest rage seems to be giving your cookies a look like aged paint. If any of you are as old as I am and were deep into decoupage back in the 70’s, this may seem like Déjà vu (all over again). The process is very simple and in a matter of minutes you can have a whole new “canvas” to decorate. The uses are only limited by your imagination. The first thing you will need to do is make a paste of gel food coloring and corn starch. I used white for this demonstration. The paste has to be thick enough to paint on the cookie. I put about a tablespoon of cornstarch into a bowl and then kept adding the gel color until I had what I thought would be the right consistency. I didn’t want it too thick because I was unsure what it would taste like on the cookie. I tried doing it on a frosted cookie but it didn’t work. You need the roughness of the baked cookie for the “paint” to grab while it’s doing it’s thing. Next you will paint a liberal coat on an unfrosted cookie. 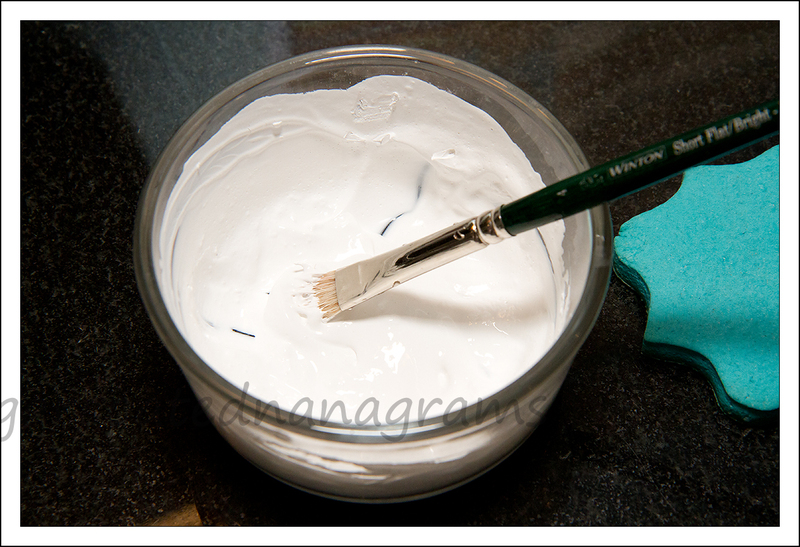 If you want large cracks you will need to apply a liberal coat of the mixture with as few brush strokes as possible. The more you brush over the mixture on the cookie, the finer the cracks become. Next you let your cookie dry. If you are in a hurry you can put it in front of a fan or in a warm oven. It only takes a few minutes to dry. This is what it looks like when you limit your brush strokes. That’s all there is to it. Here is a picture I took one that I did that has finer cracks. I brushed the mixture several times to get it as smooth as possible. 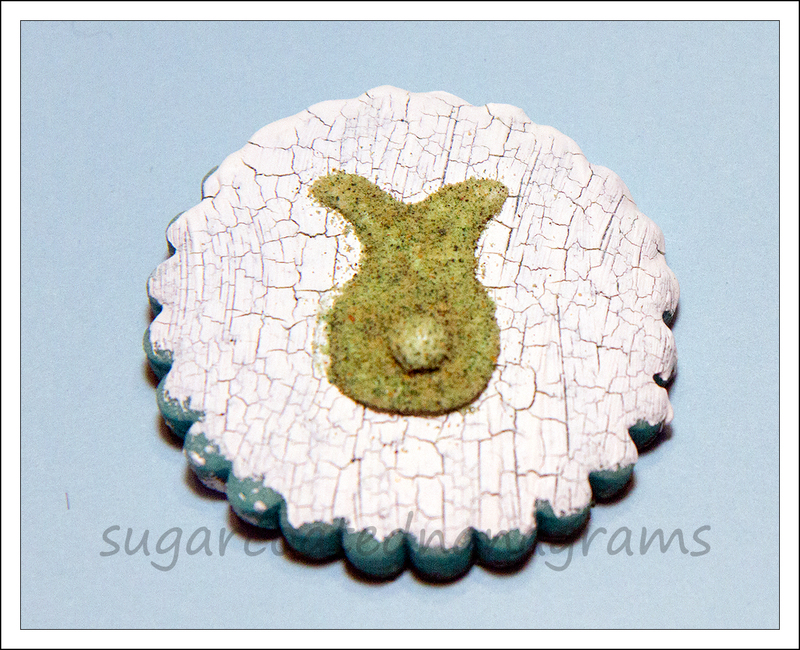 I also piped a very fast “moss” covered bunny onto the cookie to show one way to use the cookie. 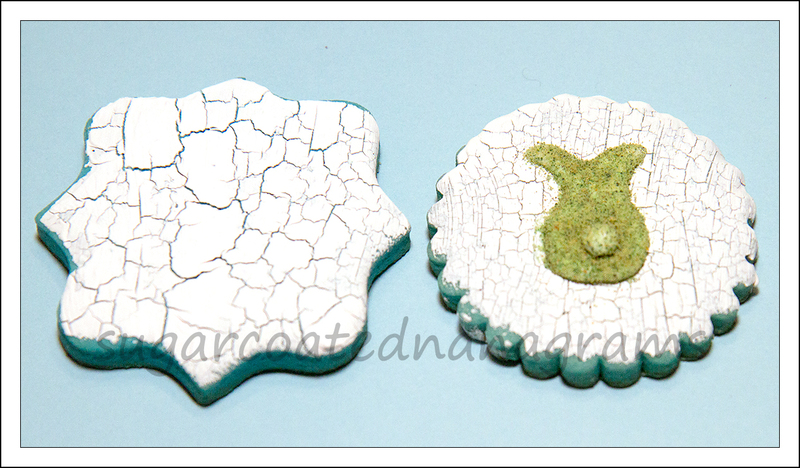 If you would like to try your hand at moss, Mike at Semi Sweet Designs did a great tutorial on it. I didn’t have any graham crackers and was in a hurry so I used pre-made graham cracker crumbs. The effect isn’t nearly as cute as when you take the time to do it properly but this will give you a rough idea of what you can do. Here is a side by side comparison. I am by no means an expert but I think this can be a fun tool to add to your cookie decorating, especially because it is really easy and doesn’t require you to buy any additional supplies. You may have noticed that my cookies are made with colored dough. I will be doing a blog post on that technique in a few days. 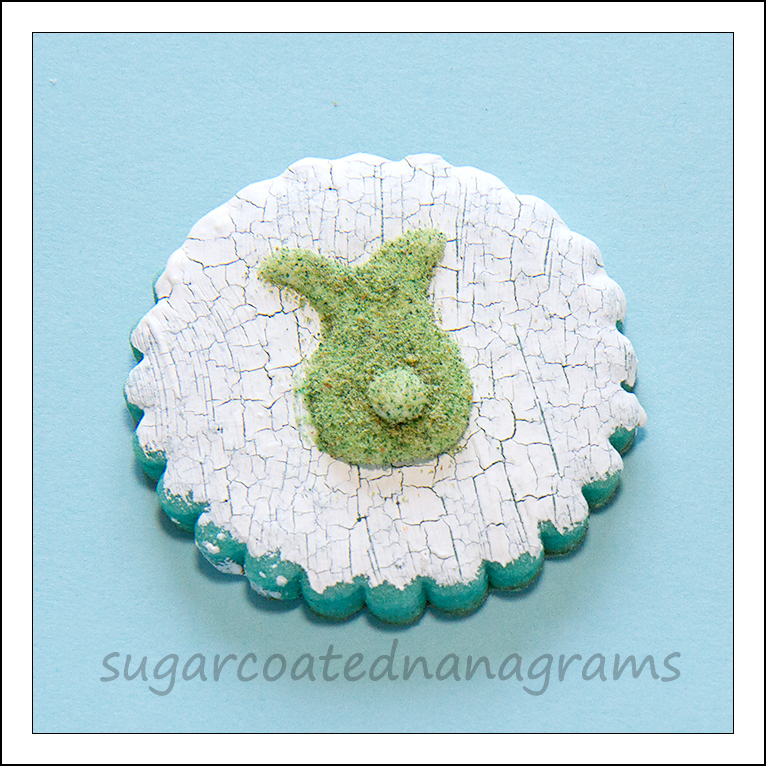 Have fun and share your creations with me on Facebook at Sugar Coated Nanagrams. I experimented a little with the crackle on this cookie. I added a dot of ivory gel color to get a more tan look to the glaze. I also added a drop of caramel flavoring because the cookie is my new Pumpkin Spice cookie recipe and I thought it would complement the cookie. 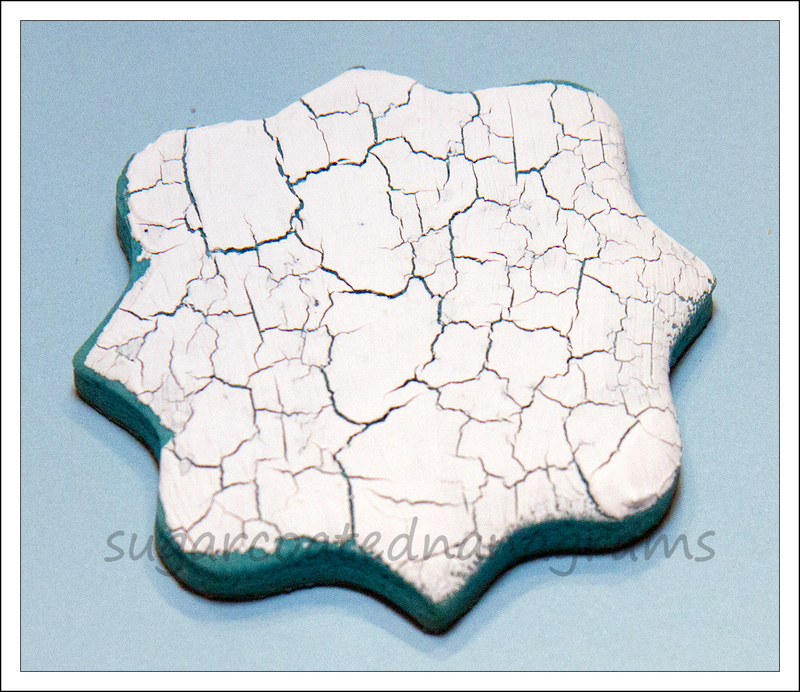 After I put the crackle glaze on the cookie I used my scribe tool to create something that would look like boards. When it was totally dry I added “nails” with an edible marker. To make the flowers I used a fairly stiff icing for the stems. The flowers and leaves were made with icing I had on hand. It was about a 18 second consistency. I put dots on the stems and used my scribe tool to drag the icing into leaf and bud shapes. It was a very quick experiment but I like the way it turned out. Do you? You are soooo talented. Just one question…do the calories exit through the cracks? Absolutely! Also, don’t forget that they fall out of broken cookies too!! Thanks for taking the time. I’ll try it. Hi! I want to try this but the gel coloring is not thin enough to make the cornstarch into paste. Is that the only liquid you used? If you only used gel coloring which gel did you use? If you want a lighter color how do you get the paste to a paste form without extra liquid? Thanks! You make beautiful cookies! Thanks Laura!! I only used white Americolor gel. I think you could add a drop or two of water to it without changing the results, if you can’t get it thin enough. The Americolor white is a much thinner gel color than the other colors. how did it work? We do not have gel coloring in Uguguay, do you know how to do it with paste coloring? thanks! I think you could do it with any type of coloring. You might have to experiment and add a little water to make a runny mixture that you could brush on. Good luck and show me what you come up with, please!! Thanks for the tutorial. How does it taste? I didn’t notice any taste. It’s different because there is no frosting but it didn’t have a distinct taste. Thanks for your tutorial. I just tried it and sadly it didn’t crack at all!! I used corn starch and Wilton white gel food coloring. I made some with a thin coat of “paint”, and some with thicker coats. Not sure how I can screw up such easy directions lol!!! I’m so sorry that you had a problem. How thick was your mixture? I saw a tutorial on this where it was just Royal icing painted on raw dough and baked. I curious what the difference is. I’m not sure because I haven’t done the other technique but this one is done on a baked cookie so maybe that is the only difference. What a great tutorial…and so easy! Thank you! Have you tried mixing any other colors with the white to see if it works? I tried the method of brushing white Americolor gel on an unbaked cookie and it crackles during baking, but the reds I used were a failure. Just wondering if they work any better using this method or if the white is really the only one that gives this effect. I haven’t tried it with any other colors. One way to get around that would be to use the white and then paint whatever color (or spray) on the top of the white. The white food coloring is a different product than the other colors, I think. It’s not like a gel like the colors are even though mine is all from the same company. The reason it works is a chemical reaction…the chemical is E-171 Titanium dioxide found in the Americolor gel colors. If you look for this ingredient, you can be assured of success in your crackle. Wondering whether this could be used over fondant? I don’t know but if you try it let us know how it worked, please! I don’t think you would have the same effect but if you try it let me know how it works. So, I tried this method with the “Wilton” brand bright white, all different consistencies, it did NOT work. I went and purchased the “Americolor” brand, and it worked perfectly!!! So, it definitely depends on brand. I’m not sure why?! I checked ingredients between both and they both seem to be quite similar. Conclusion: HAS to be “AMERICOLOR” brand. Thank you so much for the recipe. Thank you Trinity! I have never used the Wilton brand but it’s good to know that it doesn’t work for this technique. Just tried this technique and it worked, unfortunatly once you add the cornstarch the cookie is inedible, has a terrible chalky sour taste. Too bad because the cookke looked great. Beth, try it with just the white food gel on its own painted onto your unbaked cookie. I’ve been doing that lately and the crackle begins while the cookies are chilling in the fridge, before you bake them. There is no funky taste. I never got a chalky taste using the corn starch method above either so maybe try mixing less into your white food color. That’s a great idea! I’ll have to try it! Thanks!! Hi Nina, Yes, it’s just white food coloring and cornstarch. I put a spoon of cornstarch in a bowl and added the white gel until it was a glue like consistency. It was very quick. I’m sorry it didn’t work for you. How thin did you have your mixture? 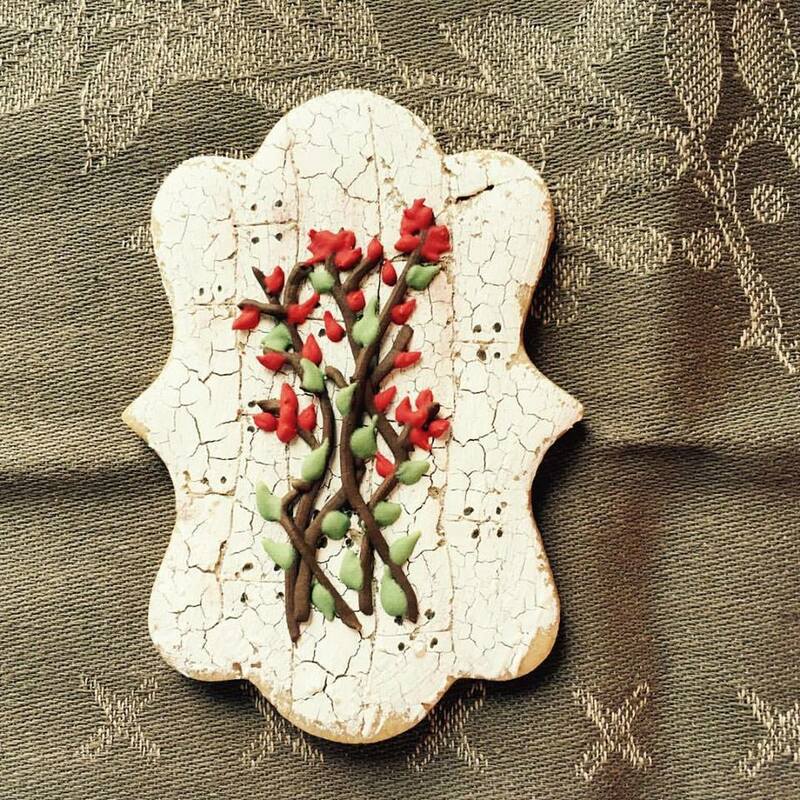 Since it needs a rough surface to cling to to create the cracks, I’m wondering if you could rough up dried royal icing in the way you would painted furniture with sand paper prior to adding a new coat of paint. Might be worth a try to improve the taste and avoid having to color dough. Not a bad idea. I’ll have to try it some time. Thanks!